The Adventures of Gulliver is a 1968 television cartoon produced by Hanna-Barbera Productions. 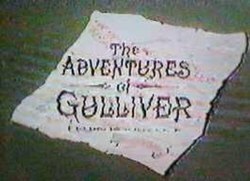 The show is based on the novel Gulliver's Travels. The show aired Saturday mornings on ABC-TV and lasted for one season in its original broadcast. While on a boat trip with his father, Gary Gulliver and his dog Tagg end up shipwrecked on an island. On this island is the kingdom of Lilliput, where its inhabitants have a height of only a few centimeters. Gary and Tagg are caught by the Lilliputians while they are recovering from the shipwreck, but afterwards they become great friends. With the help of the Lilliputians, Gary continues searching for his missing father (a subplot in the series involves a map that Gary's father left to him after secretly putting it inside Tagg's collar before the shipwreck (without Gary knowing about it)). The villain of the series is the evil Captain Leech who, in the adventures, is always attempting to steal the map from Gary. 17 episodes were produced and were originally broadcast on ABC in the fall and winter of 1968-69. The episodes were rerun through the summer of 1970. In 1971, the show became part of The Banana Splits and Friends Show, the syndicated version of The Banana Splits Adventure Hour. Toys had been produced in Germany by Heimo. The pilot episode. During an ocean voyage, Thomas Gulliver is attacked by an unknown assailant. This convinces him that two earlier accidents weren't accidents at all. He shows Gary a treasure map. The one after it is Captain Leech. When the ship runs aground, Thoms hides the map in Tagg's collar, and orders Gary and Tagg out the porthole. Captain Leech breaks in, but is swept overboard along with Thomas. Gary and Tagg are sent adrift, but find an island. The Lilliputians capture them, and after some misunderstandings, become friends. Gary and Tagg go off to look for his father. When King Pomp is carried off by a hawk, Gary rescues him, and he and Tagg are allowed to stay. Eager reveals that he's found Thomas Gulliver's watch, and Gary now believes his dad is still alive. After managing to escape from Captain Leech, Gary and Tagg drink water from a forbidden pool and shrink down to the Lilliputians' size. Now it is a race against time as they, along with Bunko, Eager, Glum and Flirtacia must get to the spring before Leech finds them. Leech makes a deal with Malagar to put Gary in a deep sleep with a potion so he can steal the map. However, Flirtacia saves him and falls victim to it instead. A Hanna-Barbera Production. Hanna-Barbera Productions, Inc. ©MCMLXVIII-MCMLXXI All rights reserved. ^ Terrace, Vincent (1976). The Complete Encyclopedia of Television Programs 1947-1976 (Vol. 1). South Brunswick and New York: A.S. Barnes and Company. ISBN 0-498-01561-0. ^ Castleman, Harry & Podrazik, Walter J. (1984). The TV Schedule Book. New York: McGraw-Hill Paperbacks. ISBN 978-0070102781. This page was last edited on 26 March 2019, at 03:25 (UTC).